Here’s a recap of our time at the BC Tech Summit. 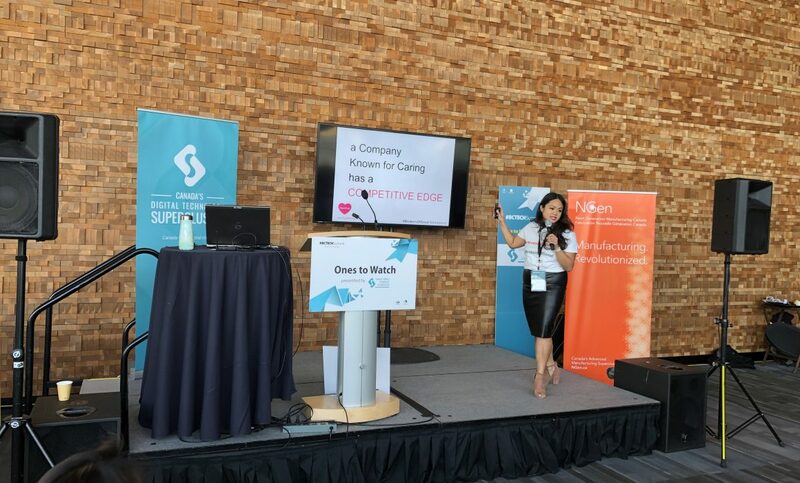 From our founder Lori Muñoz Malcolm presenting HeartPress’ story and our #BrokersOfGood marketplace on the Ones to Watch Stage, to connecting with others in the Start-Up Village, it was an amazing experience. At the #BCTECHSummit, select emerging innovators were given a limit of six minutes to share their story, successes, and how their technology has the potential to transform businesses and improve the lives of others. It was a showcase of the most ambitious companies making connections and building business opportunities. These under the radar innovators in BC’s technology sector shared a unique perspective to innovations emerging in the market. As one of the selected companies at the #BCTECHSummit ‘Ones to Watch’ stage, HeartPress’ very own Lori Muñoz Malcolm shared how philanthropy gives companies a competitive advantage and how our marketplace #BrokersOfGood can help. A huge thank you to Innovate BC for this opportunity. Exhibiting at #BCTECHSummit’s Start-Up Village was a great opportunity for us to connect with others in the tech sector! We had great conversations with fellow attendees and learned a lot from the three day conference. Individuals are keen to give even if their company isn’t. Often times, employees are ready to be giving back before their company is. And that’s ok. Businesses need to feel that they are in the right place, giving for their own reasons to start a philanthropic program. What can those individuals do while waiting for their company to give? Be a change maker in your industry with our Individual Program — the Charity Concierge Club. Sign up for the Charity Concierge Club and receive news, stories, events, and opportunities about the causes that matter to you. Employee Volunteer Programs aren’t very successful in businesses, and we know why. What is an employee volunteer program? It’s when a company gives their employees time off to volunteer – typically 2-3 days a year. Why doesn’t this work in more companies? The onus is on the employee to figure out all the details – Which company or organization? When is the best time to volunteer? Where are these opportunities located? Is this a one-time thing or a hourly obligation? With all the unknowns, it discourages employees to take the time and identify where they can give the most value in their limited volunteer time. How HeartPress can help. In the next few weeks, we’ll be rolling out an Individual Employee feature on our #BrokersOfGood marketplace. Businesses are able to choose individual charitable opportunities that they feel align with their company’s values and brand and share that with their employees. Staff can then view the list and choose an opportunity that they feel most resonates with them and their skills and passions. Have you heard? 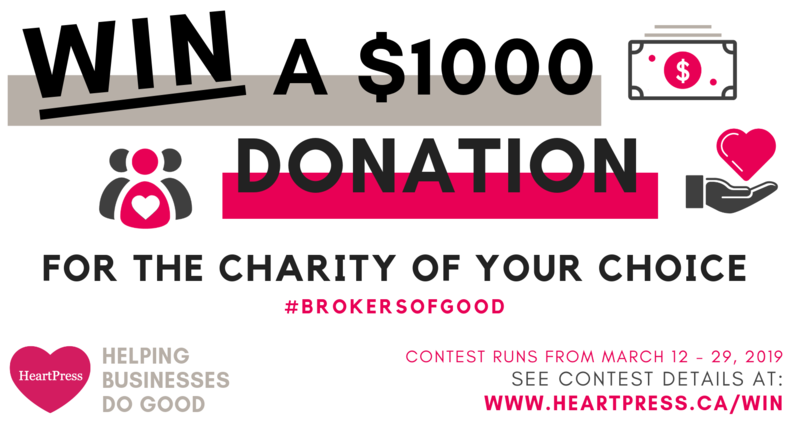 HeartPress is giving away a chance to win a $1000 donation to a charity of your choice! Enter as an Individual or Business by March 29th, 2019 for a chance to show your favourite charity some love. HeartPress understands that today’s businesses and their employees want to do more than just write a cheque. They want to find meaningful ways to engage and contribute to the community that align with their own company values. HeartPress’ #BrokersOfGood Marketplace allows businesses to search for opportunities to donate, volunteer, give pro-bono services and in-kind donations with local charities. And the HeartPress team offers support along the way to ensure that giving is a rewarding experience for everyone. 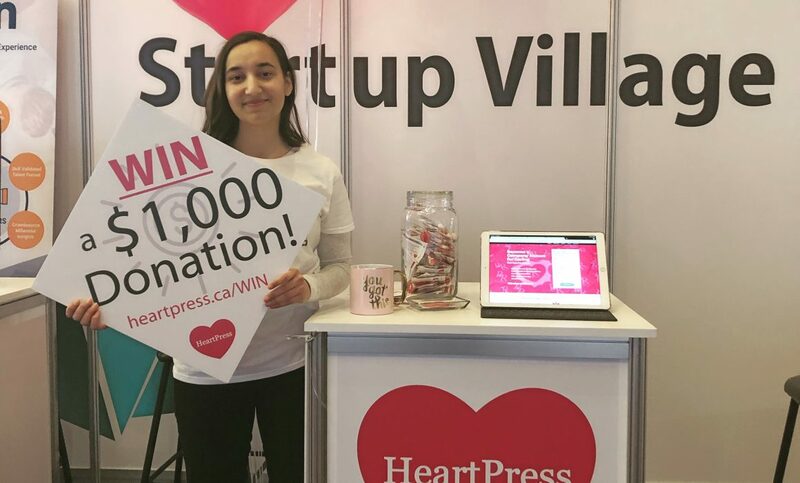 HeartPress Contest Giveaway! Win $1000 Donation!